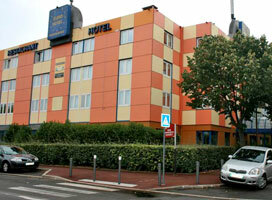 The Eurohotel Paris Cretail Metro is located in a strategic area for visiting both Paris and Disneyland. Situated in the south eastern suburbs of Paris, the 3 star hotel is just a 5 minute walk from Point Du Lac Station on Metro Line 8, meaning you can be exploring the romantic city`s sights within 45 minutes. The hotel is just a 7 minute drive from the A86 and A4 motorways giving guests great access to both Charles de Gaulle Airport and Versailles. The historic Bastille area is just 40 minutes away via metro and the lively right bank quartiers of Opera and Grands Boulevards with their grand architecture, theatres and bars can be reached in 50 minutes. Disneyland is a 30 minutes by car from the hotel, making it the perfect choice for guests wanting to visit the famous entertainment resort without having to drive through the city centre. Paris`s suburbs are the location for many of its sights and attractions including Château of Vincennes, the impressive French Royal Fortress and Paris Zoological Park, both of which can be reached within a 15-20 minute drive from the hotel. More Info.